Trouble brewed up for the ruling Congress in Mizoram on Friday as home minister R Lalzirliana tendered his resignation from the post. Lalzirliana is also the vice president of Mizoram PCC and is not in good terms with the chief minister. He was served with a show cause notice by the party disciplinary committee for his alleged treason against the party. Local newspapers in Aizawl reported that the Congress vice president was approached by the opposition party to contest the coming election with their party ticket. R Lalzirliana in his resignation letter submitted to chief minister Lal Thanhawla said that the reason for his resignation was the Congress government’s failure to recognise Saitual area as a full-fledged district. Lalzirliana said since the formation of the Congress government the chief minister had assured that Saitual area that falls within his constituency Tawi would be made a full-fledged district but failed to keep his promise. “The people of Saitual have made several demonstrations demanding the delivery of what you had promised. I find myself in a very awkward position holding a cabinet post while our government is doing nothing to deliver the promises we had made. I am left with no other choice but to resign from the cabinet post,” R Lalzirliana said in his resignation letter. The home minister made a brief statement at Congress Bhavan citing his resignation and then headed for the chief minister’s office in his private car to submit his resignation. Chief Minister Lal Thanhawla who left for Lunglei to inaugurate Chamnmari Hall this afternoon and is yet to make any statement on home minister’s resignation. Political pundits of Mizoram opined that the reasons cited by the home minister in his resignation letter were just the tip of the iceberg. “The decision taken by the home minister is the outcome of certain inevitable issues,” sources close to the home minister said. 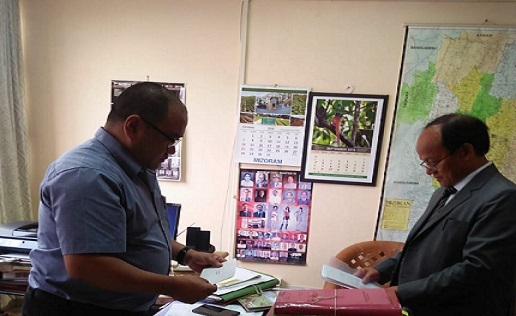 The development in the political landscape of Mizoram came two days after the Disciplinary Committee of the Mizoram PCC served a show cause notice to the home minister. The committee alleged that they sensed treason against the party after the home minister stated that he was being approached by the opposition party, the Mizoram National Front. “Without citing his loyalty to the Congress party he was quoted by local newspaper as being in dialogue with the MNF party,” the disciplinary committee alleged. The home minister’s resignation letter read that he had resigned only from the cabinet minister’s post but pledged his loyalty to the Congress party.